The Zohar (I have to look for everything that I read in this book within myself): And the Creator (the general force of bestowal, as much as I can imagine it) said to Noah (my inner desire to become like the Creator): “I have placed My rainbow in the cloud.” “I have placed” alludes to having placed it even earlier, because the rainbow is a “cornerstone.” And the cornerstone was placed in its place before even the world’s creation, for the world is founded upon it, and therefore it is written: “I have placed,” in the past tense. It is written: “Above the firmament.” Of what exists above the firmament it is written: “And I shall hear the sound of their wings.” These are the four largest and highest of holy animals upon which the firmament stands. Their wings connect, concealing their torsos. The firmament is the border of the second restriction, called Parsa. It stands upon four large animals: Hesed, Gevura, Tifferet, and Malchut. Within us there are forces called Hessed, Gevurah, Tifferet, and Malchut, or four animals on the animate level. There is the “firmament,” which separates these forces from other forces. But they are all just that – forces. All that we presently feel is depicted for us by these forces on our inner screen. Our goal is to shift from the external images on the screen to the forces themselves. Then we will be able to attain the root of our reality, begin to change it, and come to the Source. The spiritual world is a world of forces. It is only when we exist in the corporeal world that we imagine these forces as corporeal images. However, ultimately this whole imagined reality dissipates into nothingness. A question I received: What is the breaking of the Kelim, when the Creator’s qualities penetrate into the qualities of the created being? My Answer: I am created as a receiver and I only understand fulfillment. The Upper Light has influenced me and suppressed me – it showed me the quality of bestowal and instilled shame for my egoism. This was all done to me by the force of the Light. When I see the Light, I am willing to imitate it. However, inside I remain the same as I was previously. It is as though I find myself in a profound group of people who talk about music, literature, and art, and I also want to be like them. I am proud of myself and when I think back to how I was before I came here, I feel ashamed. But then I leave there and see that everything is allowed: there are no shameful desires, it’s ok to lie and engage in all kinds of filth, and therefore I also begin to think and act this way, thinking that this is the truth of life. In other words, the created being was under the influence of the Light, but this is not his inner essence; this is not the correction. We need darkness in order to begin to shine like Light, and to correct all of the filth within creation. The egoistic desire which was initially opposite to the Creator needs to be corrected, not just restricted. So how can the created being be fooled into doing this and forced to reveal itself? It is as though you bug someone continuously until he shows his true colors. This is precisely what happens to the creation when the breaking of the Kelim (qualities) occurs. However, the creation doesn’t know anything about this yet. It exists under the influence of the Light. It is as though I attach myself to a good group of people and then I also start to feel worthy, respectable, and clean. Then suddenly I am given some kind of assignment, and the whole truth is revealed – everyone finds out who I am. Imagine what shame I experience from this! I wanted to do the same thing they do: to receive for the sake of bestowal, but when it came down to business, all my evil became revealed. The Creator and the created being are situated next to each other, and they are separated by a thin barrier called Parsa. If we break this wall, then creation will reveal all the evil that is in it, compared to all the goodness that exists in the Light. It seemed that they were near each other, but suddenly the wall (Parsa) between them broke and they now stand face to face! You then see how kind and bestowing the Creator is – but look at yourself! Without this revelation of your nature in contrast to the Creator, we cannot achieve similarity to Him. The Zohar: When a person is filled with perfection he is considered to be living in the “house.” The word “house” stands for Nukvah of Zeir Anpin which emanates the Light of Mochin de GAR, as it is written: “Wisdom builds the house.” Therefore, everyone who receives from Nukvah is a resident of the house. However, when a person is in need of correction, as a result of his imperfections, he requires protection from those on the outside that could cling to him and lead him to commit a sin. When a person reaches the state of being filled with the Light of Hochma, he is in need of protection and significant correction. The Light of Hochma provides a tremendous amount of pleasure and causes major corrections to take place, waking all human desires and fueling a thirst for fulfillment by the Light. This is why a person needs to be protected from his own egoistic desires to prevent him from stealing the Light from himself and maintaining the spiritual level already attained. But how can he protect himself? As a result, he is forced to leave the house (to leave the state of being filled with the Light of Hochma), since he is not allowed to receive this exalted Light out of fear that external (egoistic) desires might latch on to him. By leaving the house, he remains on the same spiritual level, on the same step, only now on the side of Hassadim. If his uncorrected, egoistic desires, which lack the intention of bestowal, attract the Light of Hochma from above downwards, then he will fall from his spiritual level and become like all other sinners. The waves of the flood will rise and drown him. By stepping out of the house, a person makes a significant correction. He becomes stronger and acquires an additional “screen” that he can use the next time he enters and stays in the house. As a result of these exits from the house (a spiritual act), a person acquires screens. This is how he attracts the strength to overcome which he can use the next time he enters and stays in the house filled with the Light of Hochma. We have many desires and we have to sort them out. We can connect a part of the desires to bestowal, to the neighbor in the following way. Even though I understand that all of my desires are aimed at self-gratification, and I don’t have any other desires besides this, I am still able to use them for the sake of connecting with other souls – I can work with them in the middle line, in the screen De Hirik. On one hand, it is a desire to receive pleasure, but on the other hand, I can work with it for the sake of bestowal. I connect the right and left lines, using their connection for the sake of connecting with the neighbor. This is called “praying for the public,” a prayer that I raise up and receive in response a force from Above enabling me to create the right connection. It is within my capability to desire for this to happen; I can raise a MAN and receive a force called “the key” (Miftecha) that lets me reveal the heavens – the Upper World. Besides this, there are other desires or parts of desires that I cannot connect to others. I can only do so to a limit, but no farther. That is why I sever these desires or parts of desires and throw them out. I don’t work with them for now, even though later on I may have the forces to do so because I will see that by not using them for the sake of connecting with other souls, I lose out greatly and cause harm. For now however, I don’t realize the evil in them; I only see that I am unable to work with them and therefore, I simply discard them. This is how a person always works inside himself, sorting out his desires, forces and qualities, and unifying them into different groups in order to constantly create a special attitude to the neighbor from them. But while it seems to him that he is relating to the neighbor, he always reveals that in reality this is a part of him. This way, he tries to ascend from this imaginary picture to the spiritual world, where he reveals that we are all connected into one body of the common soul. A question I received: How does The Book of Zohar want to direct us? My Answer: The Zohar directs us only to revealing the world inside us and there finding all the possible inner notions – myself, the world, a the still, vegetative, animate, and human levels. After all, everything we can only imagine now, including ourselves, is inside of us. If I relate to The Book of Zohar in this way, knowing that it reveals myself to me, then the book will tell me about me. Everything I read in The Book of Zohar takes place inside me. I am essentially a screen, and the force of desire depicts various forms, images and actions on my screen. On different levels of my desire to enjoy, this force either depicts inanimate objects, or the vegetative world, or the animate world, or the human world. All of these pictures appear inside of my desire to enjoy and they are drawn by the force of desire. Similar to how we see images on a computer screen, there is a “photo camera” inside us that creates an illusion of the reality that appears before us. But in actuality, there is no reality; it is all our desire to enjoy receiving these impressions from the force that acts inside it, depicting various images inside the desire. We, in turn, discern these images as inanimate objects, plants, animals and people, depending on the level of desire that they are depicted on. Therefore, while reading The Book of Zohar, I have to imagine that I am a small world and everything is inside me; the ocean, mountains, colors, sounds, trees, people and all events are taking place inside me. Then I will gradually start to shift from images that are being described by The Zohar to qualities and forces. Instead of responding to the words of this book by imagining animals, people, trees and all the things happening to them, I will gradually begin to discern these qualities within me. In essence, there are just two qualities – reception and bestowal, but they can be present in varying degrees and expressed in different ways. We have to try to recognize everything that is being described by this book. As soon as we really make the transition to the world of forces, we will begin to see the truth and to understand that all the images we now see are an imaginary world, and in reality, it is all just forces. And then, behind these forces, we will gradually start to discern the One, Single Force – the Creator. That is how we have to read The Book of Zohar. 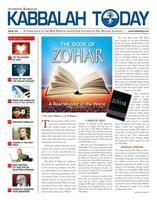 We will not be able to reveal the spiritual world without studying The Book of Zohar. It’s not because this book is so powerful and able to accelerate our development so greatly that instead of walking on foot or riding a horse, we will be flying on a plane. Rather, without it, we will be simply unable to concentrate on the inner, spiritual reality and we’ll see just the external screen that shows us this material, illusory world. We will never be able to break through this screen and reveal the forces that operate behind it, creating the projection of this movie (this world); or to break through even farther, past these forces and qualities to the ray of Light, the projector; and then even farther – to the Creator, the source of all forces, qualities and meaning. How is it possible to go from the external picture to the forces, to the Creator’s thoughts, intentions and actions relative to us, in order to understand why He is showing us this movie? What does He want to tell us by showing us all of these animals, people and everything happening in this world? Why does He give us the sensation of our life, as if we have a past, a time when we were born, our current lives and the feeling that eventually we will have to die, and meanwhile we are surrounded by an entire world and other people. Why does He make us see this dream? I am being told that my entire life of today is not real! I want to break through this life to the truth and find out: What is it that He wants? Why did He tie me to strings to control me like a puppet, making it seem as though I am alive? Why does He do everything in this way, and who is He? And what next? These questions will lead me to the answer.